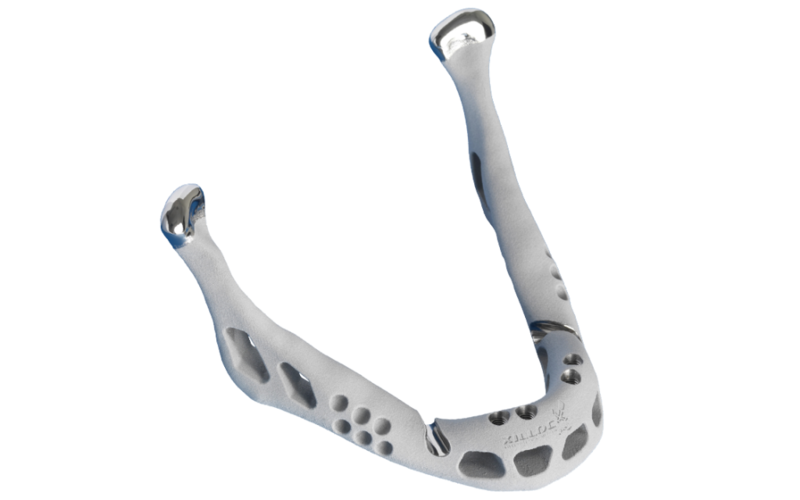 Xilloc has come out with a world première: Xilloc together with partners from the industry have created the method behind the very first customised 3D-printed lower jaw. The implant procedure was carried out a few months ago on an 83-year old patient with a serious jaw infection. This procedure rescued important vital functions (breathing, speech, chewing, sensation) as well as the aesthetic aspect that would otherwise have been lost. Xilloc worked on this project with the Xios College, the Catholic University of Leuven, the Oral- and Maxillofacial Surgeons of the Orbis Medical Centre Sittard-Geleen (the Netherlands) and LayerWise NV (Leuven – Production). This is the first time that a complete lower jaw has been replaced in a patient by a 3D printed jaw. The 3D printing technique, using a powdered metal, is ideally suited for producing this type of patient-specific implant. The fact that the technique can now be used for a complete lower jaw implant is unique. “The introduction of printed implants can be compared to man’s first venture on the moon: a cautious, but firm step,” says Professor Jules Poukens of BIOMED. Figure 1: Computer generated 3D image of the bony structures of the patient. The infected mandible is colored brown. A 83 year old patient suffered from a long lasting and rapidly progressive infection of almost the entire mandible with a large wound in her face. In order to retain an open airway and function of swallowing and chewing, surgical removal of the entire mandible was necessary to cure the patient. The classical treatment, by only removing the damaged bone, would result in a small mandible without any support and function. Another possibility was complex microsurgical reconstruction with prolonged operation time and hospital stay. Taking the age of the patient in consideration, the choice was made to reconstruct the entire mandible with a custom made 3D printed implant. Figure 2: Computer generated 3D image of the patient with the final design of the implant in blue. Hence, the patient was spared a long surgery and the temporo-mandibular joint could be restored at the same time. 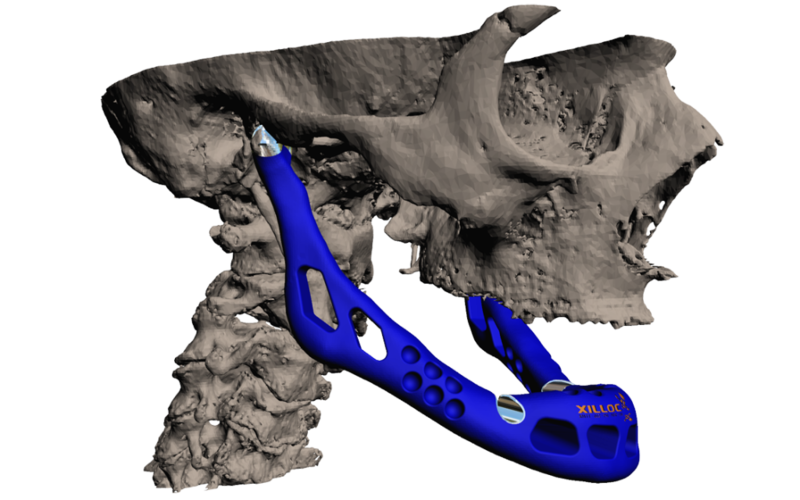 This treatment is unique regarding the fact that it is the first 3D printed custom made implant for replacement of the entire mandible. This innovative method of manufacturing by using 3D printing of titanium powder is quite unique. Figure 3: The 3D printed implant with an artificial bone coating. The rims for the mandibular nerves and the condylar heads are highly polished. Fixture sites for future prosthetic superstructures are visible. This new treatment approach was developed at the Morphology group, Biomed Research Institute, University of Hasselt, Belgium (Prof. dr. Jules Poukens, Prof. dr. Ivo Lambrichts, Dr. Ingeborg van Kroonenburgh) in cooperation with engineers from Xios University College (Dr. Ir. 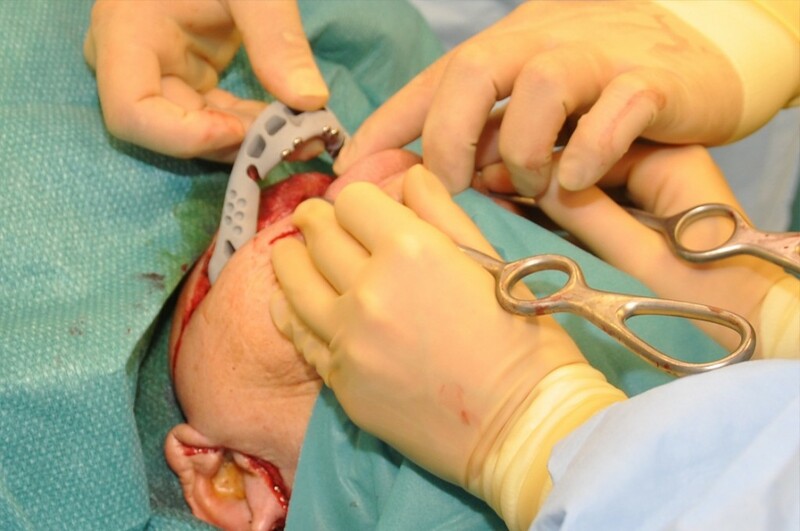 Michäel Daenen), , department Medical Engineering of the University of Leuven, Belgium (Prof. dr. Jos Vander Sloten) and the department of Cranio-, Maxillo-Facial surgery of Orbis Medical Center Sittard-Geleen, The Netherlands. The company Xilloc Medical BV from Maastric ht, The Netherlands (ing. Maikel Beerens) bridged the gap between the physician and his request for a patient specific implant solution and therefore translated the requirements from the physician in close cooperation into a perfectly fitting patient specific implant design and implant. The implant weighs approximately 107 grams. 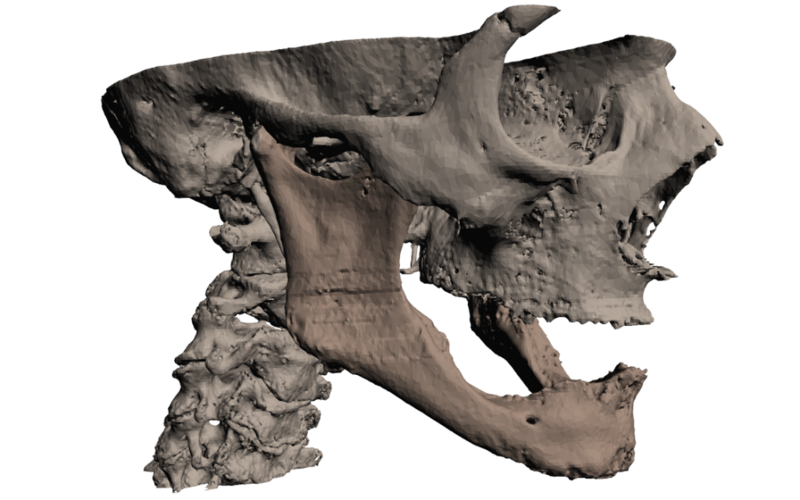 This is just a little bit heavier than a ‘natural’ lower jaw, but it’s certainly not a problem. With other methods it can take up to two days before an implant is completely ready. With 3D printing, it was ready in just a couple of hours. The implant was coated with plasma sprayed artificial bone (hydroxy-apatite bone substitute compound) by Cambioceramics, Leiden, The Netherlands. Some anatomical parts, such as the condylar heads and the rims for the mandibular nerves were polished. Fixture sites for future prosthetic superstructures were incorporated. 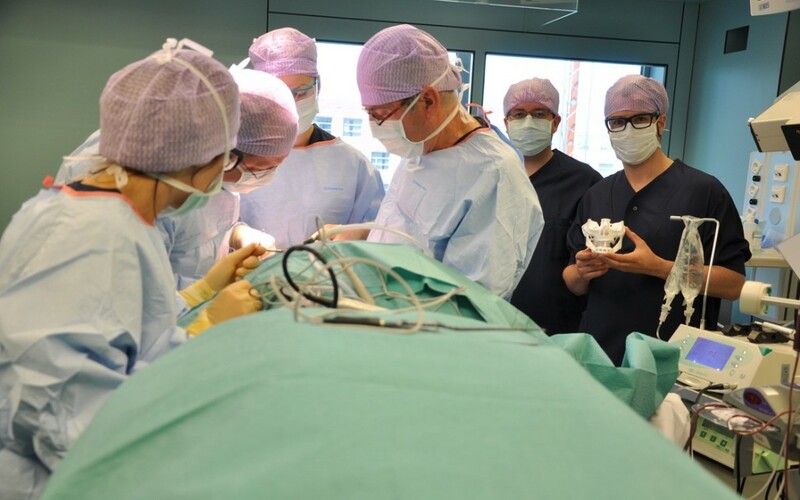 Figure 4: An image of the operation at the Orbis Medical Center Sittard-Geleen. Engineer Maikel Beerens is showing a 3D model of the skull and implant of the patient. The patient underwent surgery in general anesthesia in June 2011. During surgery the inflammatory mandible was removed and replaced by the pre-operatively manufactured custom implant. The contour of the face could be restored at the operation. Figure 5: The mandible is removed and the custom implant is almost in the right position. On the first day after surgery, t he patient showed already normal function with adequate speech, swallowing and unrestricted mandibular movement. Initially the recovery of the wound proceeded slowly but the wound healed properly through the use of appropriate antibiotics. 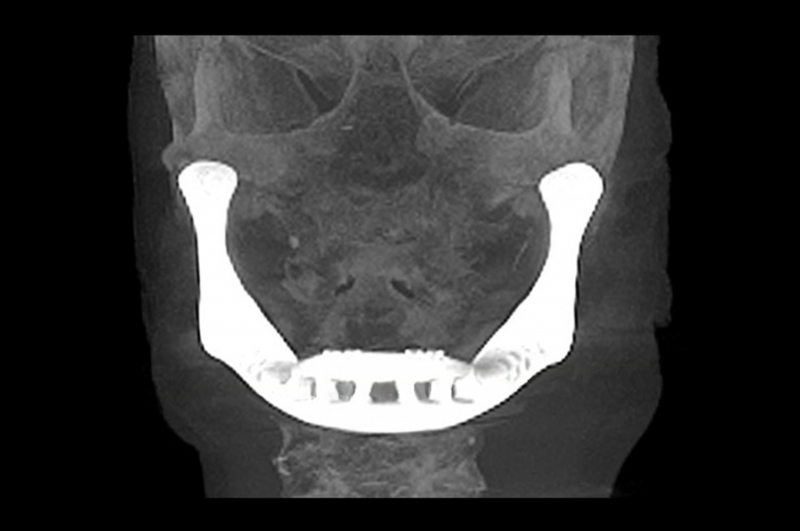 Figure 6: Post operative Xray of the patient with the full mandibular implant. Patient specific implants are an excellent addition to current treatment options and will be used more and more in the future to repair bony defects. The development of this unique implant was part of a multidisciplinary collaboration between multiple institutions in different countries. This partnership was awarded the grant of best innovation in the field of 3D printing on the RapidPro conference 2012.